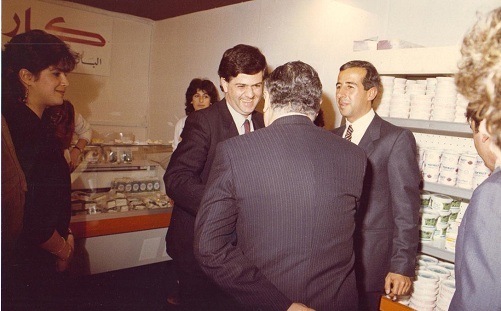 In 1971, Ara Baghdassarian the Karoun Dairy owner's son took over marketing and administration. Due to Ara's marketing and administrative abilities, demand for KAROUN'S products continued to exceed output despite several increases in capacity. Ara had the idea to undertake yet another expansion: to incorporate the firm and create a new modern plant on land fully owned by the company. Thus, Ara Baghdassarian, Alice and Khatchik Khatchadourian incorporated KAROUN DAIRIES S.A.L. (authorized on March 23, 1972). A state of the art plant was commissioned and in December 1973, the new plant took over from the old facility. 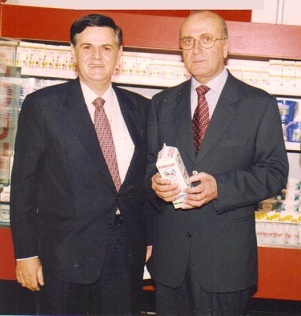 In addition to supplying all types of dairy products to major grocery and chain stores, Karoun Dairies began providing yogurt to the United Nations Interim Force in Lebanon (UNIFIL) and fresh, pasteurized milk in "Pure Pak" cartons to United States officers stationed in Lebanon. Distributors from Europe came to Beirut, Lebanon to take samples of Karoun products. KAROUN LABNEH could be found in Paris, France and London, England grocery stores. In 1990, Ara acquired the majority of the shares of the company and began the realization of his expansion plans. Karoun Dairies participated in local and international exhibitions, advertised locally and internationally and had its own website. KAROUN DAIRIES flourished under the firm direction of Ara Baghdassarian. In 1996, for the first time in Lebanon, KAROUN introduced yogurt, labneh and yogurt drink in NO FAT- NO SALT varieties. In 2007, KAROUN DAIRIES INC.* registered in New Brunswick began operations, supplying Middle Eastern cheeses to retailers in Canada. In 2008, KAROUN DAIRIES S.A.L. licensed to KARLACTI, Inc., a USA corporation, its logo, trade dress, processes and formulae. KARLACTI, Inc. is the sole licensee of KAROUN DAIRIES in the USA. Today, KAROUN is the proprietary trademark of KAROUN DAIRIES SAL in many jurisdictions in the world including Australia, Canada and Europe. KAROUN DAIRIES' logo depicted above is registered among others in USA. KAROUN DAIRIES is ready to cooperate with strategic partners on a sound business plan in its mission of providing healthy and natural food and refreshments for all.